I got my warmer of the month a couple weeks ago and I had to take it out of the box right away. I LOVE this warmer! I normally don't say that ... I might go with "cute", "interesting", or "different" ... but this one I LOVE! 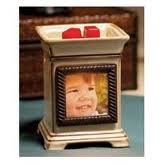 I can't believe that it's taken this long for them to come up with this concept; a photo frame on a warmer! And the neutral colors make it perfect for any room in the house. This one is definitely a keeper! Snapshot and Autumn Stroll (scent of the month) are available for 10% off during October. Let me know and you can have your very own here in about 2 weeks.